Anybody having problems with blowing speakers with the boom stereo? Funny you should mention it,had Stage II installed by dealer 6 months ago. Riding last week, and sounds like left rear speaker is blown. I was under the impression that the warantee did not cover speakers. Is that correct or am I misinformed? If not covered under warrantee I am going to go with aftermarket on rear as not impressed with blown speaker after 6 months. I have a friend who has had at least 3 new speakers in his right saddle bag and two in his left. 18 CVO Street Glide. Vendor knows there is an issue according to HD. An improved version is due out in the next few weeks. As FLSTFIDave mentioned my 18 has been blowing speakers. Not including the factory speakers there have been 4 left and 4 right saddlebag speakers replaced. When speakers 7 and 8 blew a MoCo Rep came to the dealership and inspected the speakers. He determined that there is a manufacturer defect with the seal between the cone and speaker (that's the way it was explained to me). Apparently the broken seal is causing the distortion. The Rep contacted the manufacturer and they confirmed the defect. The manufacturer said they will upgrade the speaker to correct the defect. They said the upgraded speakers would be available sometime near the end of July but I haven't heard anything from the dealer yet. Hopefully when I get back from my 1 month road trip they'll have the upgraded speakers available. That's great if the MC finally identifies the problem, but will they recall all the bikes that have these defective speakers?? I doubt it I would be happy if you come in with a blown defective speaker and they replace "the PAIR" for free, doesn't have to be a full recall (it should) but at least take care of their customers. Update...had left rear speaker replaced today under warranty. They said that it is the same part # and that there is no new part # available so, updated speaker or same old same old? Same for me. Replaced right rear. No new speakers. Dealer was not aware of any change or fix either. I have my bike in now for its 1K service and the front left speaker is waiting to be replaced. It didn't sound right from the first time i cranked it up. I decided to have new speakers put in from a non oem. Had to remove the small tweeters and it actually sounds better and has a sleeker look. It costed me but I was tired of the bad sound. 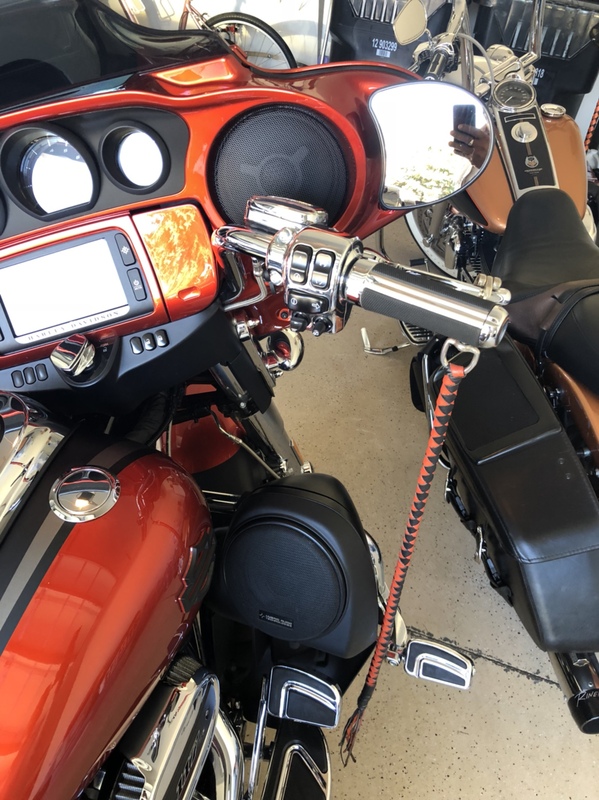 had soundz install speakers and amp when I was at Sturgis ,,,, all I can say is I didn't know what I was missing... pricey yes, but worth it if you like your music. Sounds like we have the same set up. They replaced the front amp and left the back 2 amps and replaced all the speakers. Low-Key do you have any photos of your new speaker set up please? Here are the speakers. Cleaner look with out the tweeters That’s all. 1 new Amp in the fairing and the original amps in the saddle bags. Also have the Harley lights to light up the speakers. Looks really cool at night. On my second saddlebag speaker. Soundz.com doesn't work but this one does.